5 reasons your office needs a pool table. Now we can't promise an unbiased take on this one, since it is inconceivable to imagine our office with no pool table, but the research and anecdotal evidence does suggest a game of pool during the working day might be just the thing to boost the general wellbeing (and therefore the effectiveness) of a workforce. Here's our quick guide to why your office is crying out for a new addition. Fact. Inject a bit of fun into the office and you have a happy workforce, and a happy workforce is more productive. Research shows that they are actually 12% more productive than someone just marking time (more about that research here). Plus, close friendships at work boost employee satisfaction by almost 50% - that’s a massive impact on your business! In short, it really pays to put some effort into ensuring your team enjoy being at work. So how to foster a happy, sociable group of employees? 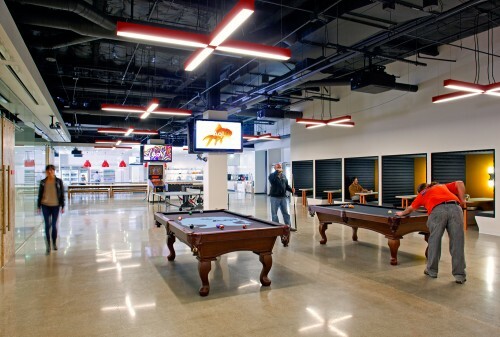 We aren't suggesting you creative a Google-style campus but a pool table is a big step in the right direction. 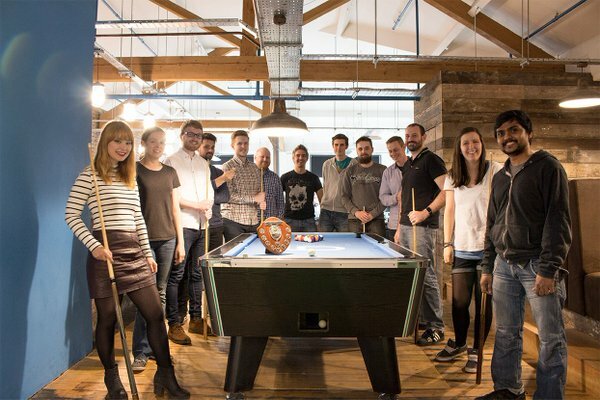 A game of pool gives a fun focus to break times, gets people mixing, shows them that you as an employer care about their well-being and really helps builds team spirit. There's plenty to be happy about there! 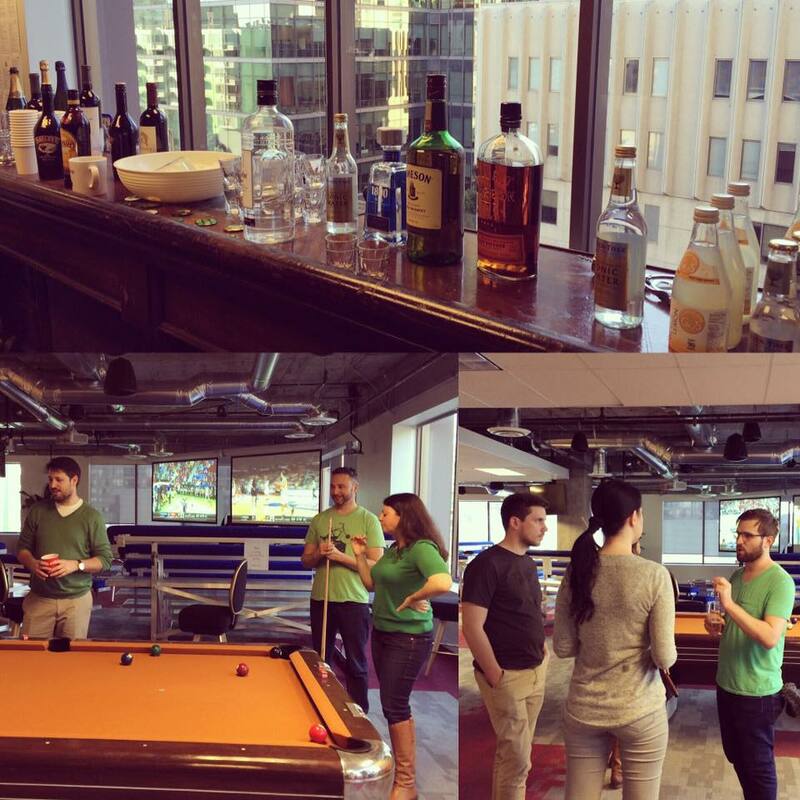 The St Patrick's Day celebrations at Instapage - round the office pool table of course. Getting involved in a competitive activity encourages the latent go-getter in all of us, which is a huge advantage in a crowded marketplace. Join the triathlon club for your dose of competition if you wish but pool is just the ticket too. The proliferation of pool leagues and teams is testament to the competitive nature of the game plus the barriers to getting involved are also pleasingly low and ideal for the office environment: you don't have to be super fit, both men and women can play, you can play in teams or as an individual. An office pool ladder is a simple way to foster a competitive spirit and learn within a fun setting that winning and being successful feels good. Pool especially also trains you to think ahead, be strategic and seize opportunities when they arise. Grrrr. The annual CTI Digital pool tournament! 3. It's good for your health! A sedentary office job that involves a lot of screen work has to be about the worst thing for your body with much higher instances of eye strain, upper limb problems and fatigue among keyboard tappers than other groups. All very bad. To counter it, Health and Safety encourages us to take regular, short breaks, move around, look at distant objects occasionally, and do this before you hit the wall rather than as a way of recovering. To the rescue, The Pool Table! A typical 10 minute game of pool achieves all those things and is a lot more fun than walking around the office staring out of the windows. Grab a game during the day with a similarly screen-staring colleague and you’ll both be back at your desks refreshed and ready to knuckle down again. AOL's Palo Alto break out area. They know a thing or two about screen time. A creative and well thought out office space can be as inspiring to potential employees as it is to those already working for you and tells them a lot about your business ethos. In a highly competitive market, where it is hard to source and retain good staff, this really matters. Especially in tech industries, staff are younger, less likely to be open to purely financial incentives, and often with shorter attention spans, hence why big companies are investing millions creating amazing office interiors that frankly make the mind boggle. As a smaller scale but no less important recruitment tool, going to the trouble of creating a fun break out area for employees to enjoy freely shows that your business has a human side and is not just about sales figures, that it cares about the people who work there, and that your company is fun! Who wouldn’t want to work for that kind of employer? Adding a pool table to your office might just tip the scales in your favour. 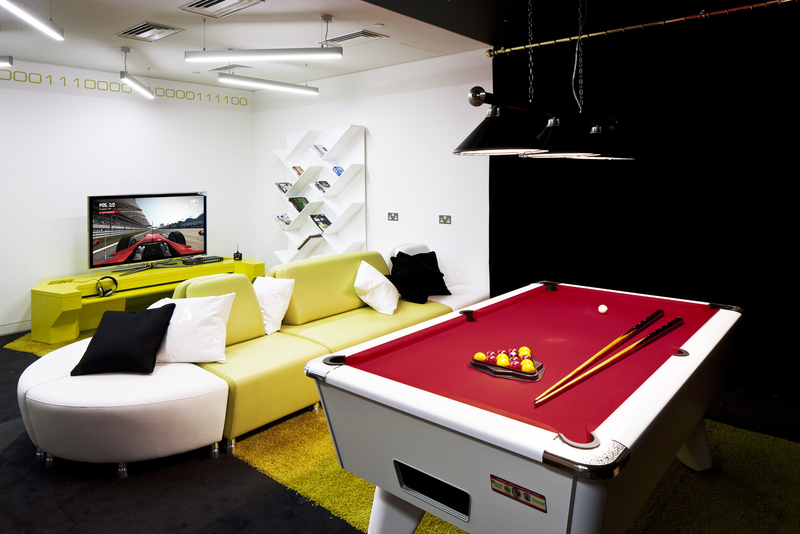 Google HQ in London - who wouldn't want this set up at work?! The modern breed of pool dining tables combine a top-notch pool table with a shallow design so that you can sit at it comfortably. With the hard covers on, it’s an incredibly stylish meeting or conference room table and, with some custom design, a great way of branding the space to boot! 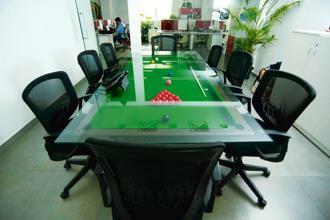 Got a pool table in your office? We'd love to see it! Tweet us @kingswood_uk or post on our Facebook page with a pic.